The Huawei Ascend P6 is a phone that reached at it’s time the highest-end spot on Android devices. It was characterized as the slimmest phone in the Android mobile market when it made it’s debut. To reset Android on Huawei Ascend P6 phone we will use the two popular methods: First, the combination of buttons that allows us to access the Android recovery system and secondly, if you still got access into your Android OS, then you will be able to restore the system from the settings menu of your Huawei Ascend P6. Both methods erase all unnecessary data from the device, if it is your case, you can backup your information with an application of Google Play. 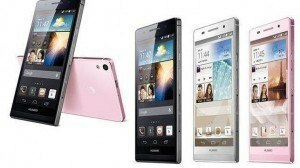 If you are trying to reset Android on your Huawei AScend P6 because you got it locked with a pattern lock that you forgot, then you will have to resource to the first method, the one that uses the phone buttons to perform the Android hard reset without the need of accessing your Android OS. This method involves pressing some buttons simultaneously to access the Android system recovery menu. From there we can restore the Huawei Ascend P6 phone into its original factory version. This type of restoration is useful for those who do not have access to the system either due to damage or because they have forgotten the unlock pattern. Use the volume buttons to navigate through the options and select “Wipe Data / Factory reset” using the power button to confirm. The process will take a few minutes. Your Huawei Ascend P6 will restart with the original factory settings. And so the Huawei Ascend P6 will restart with original factory settings.